We are pleased with the way it turned out. Are you looking for a way to make sure that your business outshines all the distractions and competition around it? If you are, then there’s no better way to go about this than with a customized lighted sign. Available in a variety of shapes, styles, types, and sizes, lighted signs can be used throughout any business. Many businesses, including yours, could enjoy some of the benefits the different kinds of backlit or lighted signs have to offer. While some of these signs like emergency exit signs are commonplace in every business, other options can prove beneficial when it comes to signage purposes. 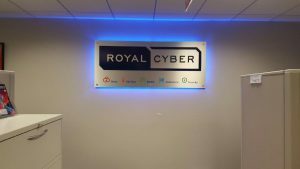 At Visibility Signs & Graphics, we make custom logo lobby signs, lighted storefront signs, and other LED signs that suit your needs, business and budget. Our goal is to become your go-to sign provider when it comes to your business’ identification and promotion needs. Call Visibility Signs & Graphics today at (801) 923-5961 for a Free Consultation with a Lighted Sign Specialist! Although the feel and look of a traditional neon sign are still quite appealing to a lot of people, most of them often find that repair and maintenance costs don’t make these signs a worthwhile investment. With advancements in technology leading to the creation superior lighting options like the LED bulbs, we now have lighting options that are cost-efficient and more dependable than neon. LED lighted signs mimic the appearance of neon signs, but are more versatile, less expensive to maintain, and have a much longer lifespan. If you are looking for that classic neon sign feel but don’t like the expense of having one, then our LED lighting solutions are what you need. Contact us today and let us know what you need, and we’ll turn your vision into reality! The traditional neon lighting look can now be achieved using high-efficiency, low-energy LED bulbs. LED signs can create that retro vibe neon lighting signs offer but with a more environmentally-friendly footprint. 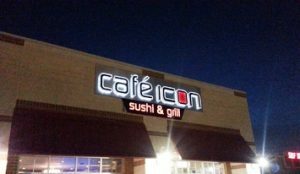 LED lighting can be used in many different ways when it comes to signage applications compared to neon. Cabinet signs and channel letters can also benefit from the backlighting option LED lighting has to offer. 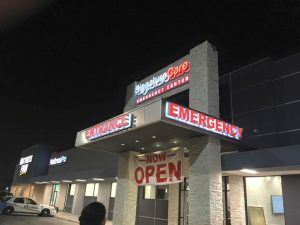 Lighted signs can light up space in your business when it’s dark and can be beneficial to late-night businesses like nightclubs, theaters, hotels, restaurants, and convenience stores, and gas stations. Our LED lighted signs can be customized to fit your desires and needs, and are available in a variety of styles, animations, and colors. 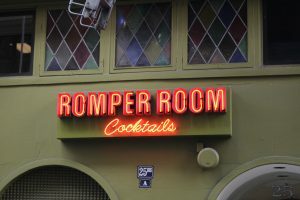 Apart from use on storefronts, LED and neon signs are also quite suitable for indoor use – a good example is a lighted OPEN sign. Aside from that, they can be used in many different ways to promote various aspects of a business. For instance, restaurants often use LED signs to provide smooth customer flow or to highlight pickup and order stations. Lighted signs can be customized to create something that suits your imagination and needs. Our sign designers are skilled professionals who are able to turn an idea into reality. 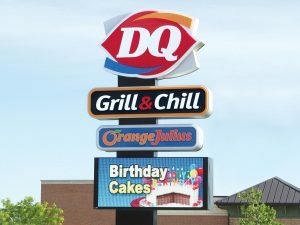 If you are looking to make your business more high-tech, you will be glad to know that we can create customized programmable LED Message Center Signs that are unique to your business. Our signs can be used as part of a greater sign like the one at your storefront or alone. Lighted Message Centers present numerous benefits compared to standard neon signs. The good thing about these signs is that custom messages can be added, so they can be easily updated using whatever messages or colors one wants, whenever they want. Some of our models can even be customized using full-color, eye-catching graphics. At Visibility Signs & Graphics we are more than willing to help you achieve what you need when it comes to LED and neon sign production, from design and installation to minor and major repairs. By having us create your custom sign, you can rest assured that you will not only be getting a quality sign but will also have a trusted sign partner by your side. 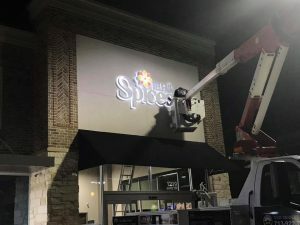 As a comprehensive signs shop, we have everything needed, from the equipment to the skills, to create all types of LED lighting signage for use almost anywhere. Our LED signage options include ADA signage, interior signs, exterior signs, lobby signs, trade show displays, and many more. Outshine your competition with customized LED signs by Visibility Signs & Graphics! Call Visibility Signs & Graphics today at (801) 923-5961 for a Free Consultation with a Neon Sign Specialist! Very clean and very classy design work.